Champion Rob Hogan competing at the 2015 Speedgolf World Championships which were held at the Glen Club in Glenview, IL on October 19-20. Rob completed the two-day competition with a 36-Hole Total Speedgolf Score of 243:28. It's hard enough to shoot 78 in four hours. One man did it in 40 minutes. The 2015 Speedgolf World Champsionships took place this week in Illinois, with the winner, Rob Hogan, shooting a spry 78 in only 40 minutes in the final round. 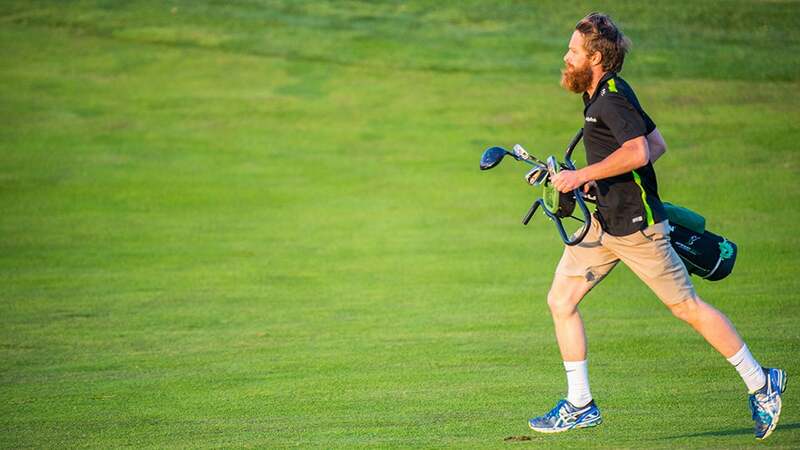 Speedgolf, also known as extreme golf, was most likely born in the late 1970s, when a track star decided to combine running with golf. Scores in speedgolf are calculated by adding the number of strokes to the amount of time it takes a player to complete the course. To clinch the victory on Tuesday, Hogan's score for the two-day event was 243:28. Hogan, who is from Ireland, previously won the Championship in 2013 and was a close runner-up in 2014. In second and third place this year were Scott Dawley, from Texas, and Mack McClain, from Colorado. Dawley had perhaps the most exciting round of the tournament; he shot 72 in 48 minutes. Like What You Read? Check out the all-new Extra Spin Homepage for More!